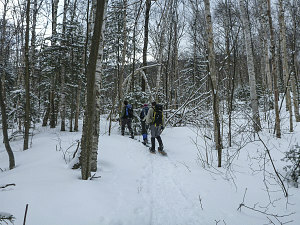 Today was an intro hike-ish sort of day: Chris' wife Gillian was along for her first Adirondack winter hike, and the plan was to choose something straightforward and short. We thought of several good candidates: Jay, Ampersand, Catamount. 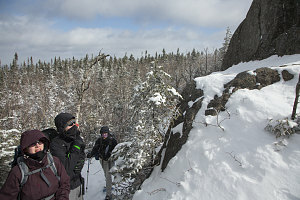 In the end, we decided on Hurricane Mountain, a small peak with an excellent summit and a short approach - and a mountain which I had not climbed for nearly ten years. 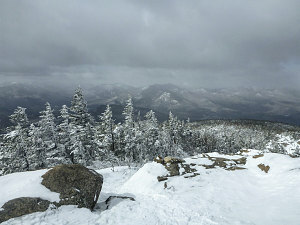 Additionally, I decided to approach Hurricane in a way I had never done before - from the north, via the trailhead for the Nun-da-ga-o / Soda range. Might as well try and cover some new ground when possible! 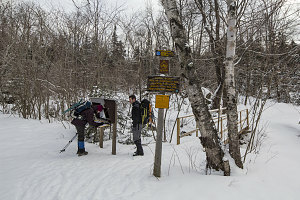 The Nun-da-ga-o trailhead is accessible via O'toole Road. 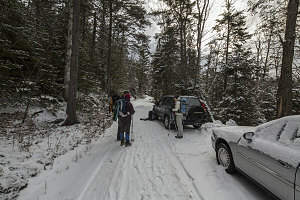 O'toole Road is a minor side branch of the already minor and twisty Hurricane Road, which climbs up from the town of Keene. 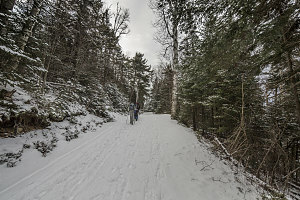 The last bit of O'toole Road leading to the trailhead is unplowed in winter, forcing us to stop and hike a little farther than one normally would in the summer (only by about half a kilometer / 500 yards). 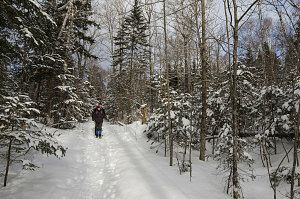 A short ten minutes of walking brought us to the summer trailhead, where we signed in. 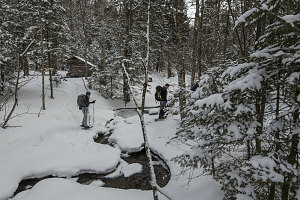 Our route followed the Nun-da-ga-o ridge loop trail south, as far as the Gulf Brook Lean-to. 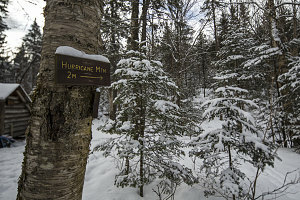 From there, a trail south to Hurricane branches off. 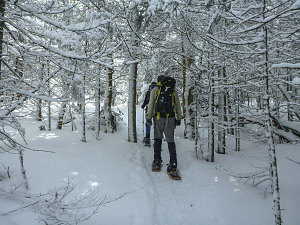 There wasn't a particularly large amount of snow depth at our starting elevation of 2250 feet, and the snow was quite hard, so we decided to bare boot it along the first section of trail to the Gulf Brook Lean-to. 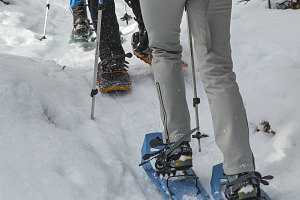 The terrain along this section is quite flat, with only gentle up-and-down undulations. 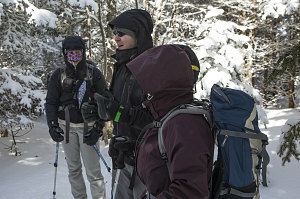 Even though it was quite chilly out, we soon warmed up nicely and shed a few layers. 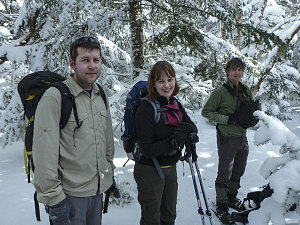 We encountered a small group camped at the Gulf Brook Lean-to. 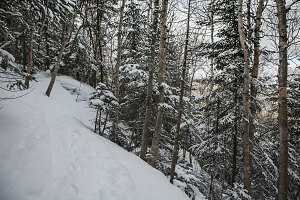 A quick chat revealed that they had broken out a trail on the north route to Hurricane the day before. 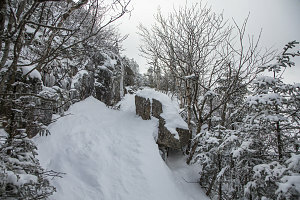 I had wondered if we might have to break trail ourselves along our planned route, since I surmise that most folks ascend Hurricane via the shorter and more easily-accessible southern route. 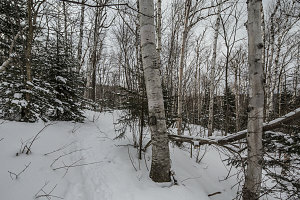 The trail south to Hurricane immediately crosses Gulf Brook - which was an easy hop on this day - and then very gently ascended up a broad valley, crossing and re-crossing the small brook that drains Hurricane's northern flanks. 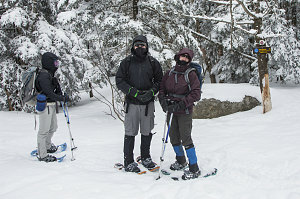 A few inches of fresh snow had fallen since the previous day's party had ascended the trail, but even so, the base was quite firm and easy to follow; our snowshoes helped more for their traction than for loft. 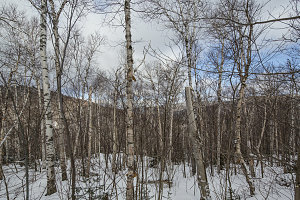 After about half an hour of gently ascending through a nearly all-birch forest, we reached the beginning of the only real bit of steepness on this route - a straightforward 750-foot ascent up the north aspect of Hurricane, where it reaches a small flat spot (still in the trees) just to the west of the summit block. As we had ascended, we had noticed the air becoming a bit more agitated, and the treetops much more animated. 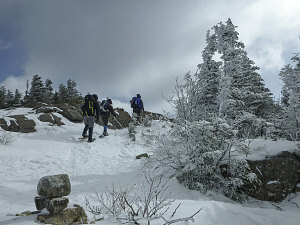 Combined with the fairly chilly day, we knew it would be cold on Hurricane's open summit. Therefore, at the aforementioned flat area, we decided to have our lunch and to put several more layers on. 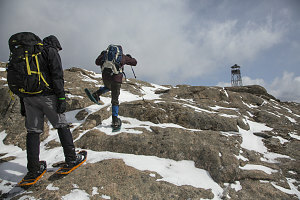 After our re-layering break, we continued on, soon ascending onto Hurricane's open summit ridge. 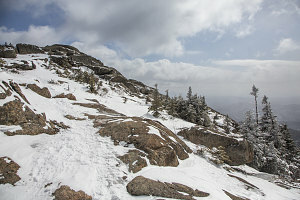 Hurricane is one of those lower Adirondack peaks that has a very nice bit of open summit terrain, and the wind whipped about us as we continued on, exposed to the full force of the weather. Light and shadow chased each other across the bedrock as the sun made periodic appearances through the racing clouds. 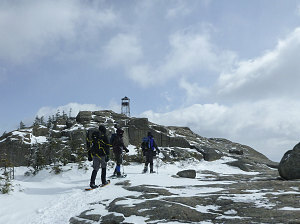 It was only a few short minutes before Hurricane Mountain's firetower (recently saved from removal by a historical preservation society) came into view, and we reached the summit itself shortly thereafter.